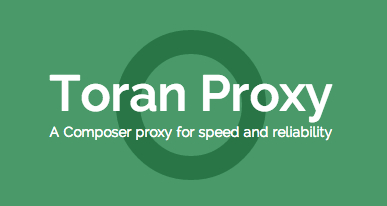 Toran proxy is a Composer proxy for speed and reliability made by Composer's creator himself (take a look to his article. It is destined to replace satis and be stronger than this one. But it will also make the composer's creator earn money for his job (And if you want use it, please pay him). So i will give you few instructions to make this proxy work in a webserver and have a better security to access privately (thanks to Symfony2 ). You can now go to Private Repositories tab and add a repositories you want. Note about artifact repo type, it's seem very useful but he is not well documented (I had to look at composer source to know how it's work). For this kind of repo you have to give an absolute directory path and toran will search all .zip and .tar files inside (he will look at all subdirectory inside too) and look if they have a composer.json, if they have he will report in his index. I tried it and it's really works well. Coupled to a webdav can be really interesting. But your toran proxy isn't secure and everyone can access to this website. And you're done, i hope it will help some people to get start with toran.